Although world war ii had begun, italy was still neutral when the 1940 mille miglia (thousand miles) was run in abbreviated form. 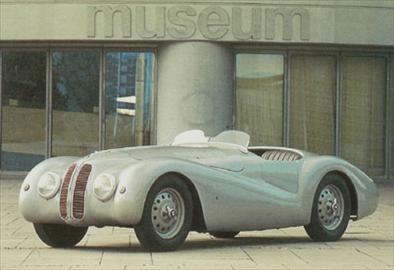 Restricted to 1,000 km., it was won by a bmw 328. Top speed of 125 mph engine typedrivetrain: Overhead-valve, in-line 6 displacement 1,971 cc power rating 130 hp transmission 4-speed manual chassis: Coil-spring suspension, indepenВ¬dent in front; Rack-and-pinion steering; Hydraulic drum brakes; About 1,875 lbs. Streamlined bodies the red italian cars were competing against white ones from germany and blue ones from france (which was represented by delahaye). Bmw fielded no, less than five cars, all 328 specials, three of them roadsters and two coupes. They sported remarkable streamlined bodies made by the italian bodymaker touring from designs by reinhard von konig-fachsenfeld. The six-cylinder engine, which had hemispherical combustion chambers, reached 130 hp, compared to 80 hp for the production model. outrunning an alfa romeo the 1940 mille miglia took a triangular route from brescia to cremona to mantua and back to brescia. The winning bmw 328 was a coupe driven by baron fritz huschke von hanstein and walter baiimer. It averaged 103.5 mph in outclassing an alfa romeo on its own ground. The cars would run again in england after the war, when the engine was improved by frazer- nash. Touring would go on to fashion similar ferraris and the jaguar xk 120. This roadster was one of the bmw328s that contested the 1940 mille miglia, held in italy despite the outbreak of world war ii.